Your humble scribbler, in a light moment. Words come to me and I must write to set them free. If you read these words, or not, my work is done. Man Parks Car Up Front, Every Time! The P-51 Mustang was the most successful fighter of World War II. It is generally acknowledged by children and experts alike as their "favorite airplane". Only about 100 of these great aircraft remain in flying condition, and they are extremely expensive to maintain, so they appear only on special occasions such as the Reno Air Races, air shows, and in very, very rare cases they are available for joy rides to people who have expensive fantasies and are lucky enough to be able to afford this once in a lifetime adventure. 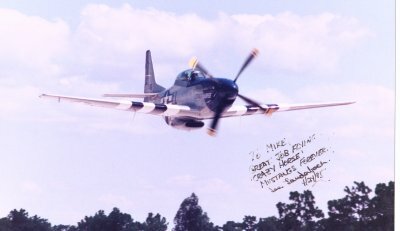 "Crazy Horse" is located in central Florida and I flew on a commercial airline (yuk) coast to coast and lived in budget motels (double yuk) just for the opportunity to fly this awesome aircraft. However, my mission was even more specific. I wanted to learn to fly it good enough to be allowed to fly it from the front seat, something almost nobody gets to do. Someday, I'll write the story of this magical fantasy come true. What do you say to the pope when you meet him? That was a question I wrestled with for months before the big event. 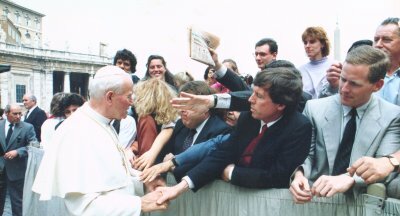 Here I am in St. Peter's Square with a couple of hundred thousand other people who want to meet, touch, be touched by, be blessed by, healed by, prayed for, helped by, and even sell something to... the pope. A generally busy guy, you don't get a lot of time with him, so whatever you are going to do when you meet him, you gotta do it fast. Arrangements were made that I would meet the pope at a certain place on the pope's Wednesday afternoon gatherings in the Vatican.